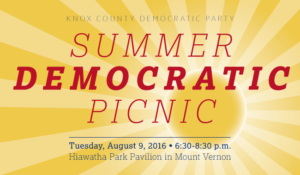 Join your Knox County Democratic friends for KCDP’s 2016 Summer Democratic Picnic! The relaxed, informal gathering will take place on Tuesday, August 9, 6:30-8:30 p.m., at Hiawatha Park Pavilion, 100 Sychar Road in Mount Vernon. Shannon Smith will provide acoustic entertainment, and 2016 candidates will be in attendance. KCDP will provide sandwiches and bottled water. Attendees are asked to bring a covered dish to share and a favorite non-alcoholic beverage. The suggested donation of $20 will benefit KCDP in this important election year. Students and children may attend free of charge. An RSVP is suggested but not required. 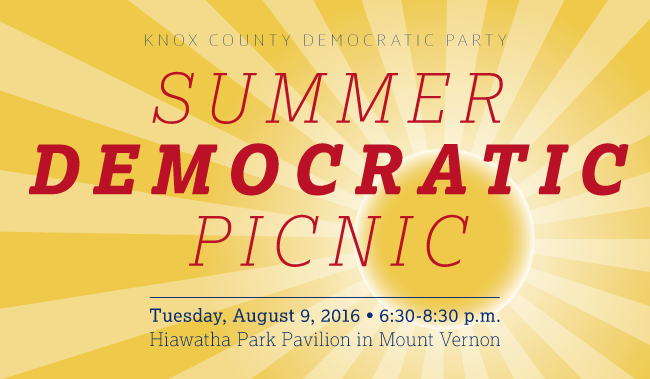 Email events@knoxcountydems.org to RSVP or for more information.